Stephen Rew is a British artist based in London. In 2008 Stephen completed a Bachelor of Arts degree (Hons) in Illustration. During this period he spent time stalking and studying wildlife in the remote regions of India and Africa’s Kwa-Zulu Natal. His long-term objectives to combine artistic practices with a love and respect for wildlife began to emerge. In 2010 Stephen began to study the technique and history of forging Damascus steel under the tuition of a master blacksmith in London. Following a trip to India in 2012 Stephen began to expand his knowledge and experience of the materials, processes and possibilities working alongside craftsmen in Rajasthan, India. These craftsmen have been producing Damascus steel blades and armoury for generations. The Damascus process has unpredictable results and it is the unpredictability of the outcome that makes this project so unique. To create a truly accurate representation of the skull was also important to Stephen. By using real skulls, digital manipulation and manual adjustments to the 3D print, Stephen has been able to produce near-perfect partial skulls of the African animals. 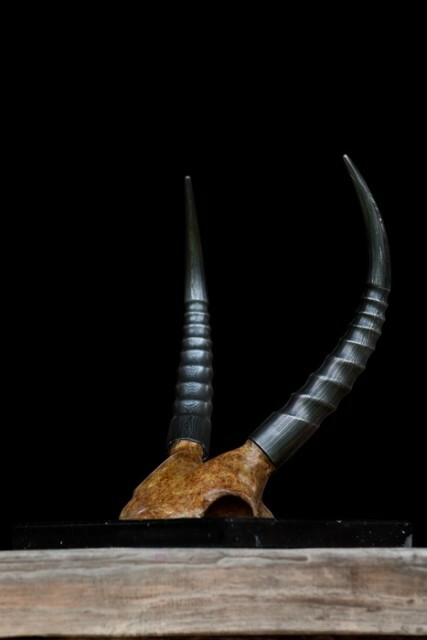 The completed horns are a graceful and elegant interpretation of Stephen’s deep love and understanding of both the natural world and generations of skilled forging. It is an enchanting story of collaboration, contradiction, hard work and above all craftsmanship. The Wykeham Gallery is delighted to exhibit Stephen’s remarkable and unique work.